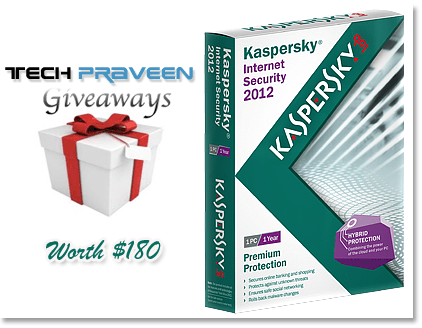 Protect your PC with FREE Kaspersky Internet Security 2012 by participating here. We started giveaway program for different products and many got benefited. 🙂 This October we are providing FREE 3 License Key of Kaspersky Internet Security 2012 worth $180 to our blog readers. Kaspersky Internet Security 2012 is a full-blown security suite designed to clean your computer of malware and keep it protected against the entire range of digital threats. Besides its anti-malware capabilities, the suite also sports a parental control module, which allows users to impose restrictions as far as usage of Internet, applications and even the computer are concerned. The connection to the Kaspersky Security Network (the cloud) ensures fast response times against the latest threats, improves performance and lowers the risk for false positives. How to Get FREE “Kaspersky Internet Security 2012 License Key”? 1. Subscribe to Computer Tips & Tricks. 2. Head to Contact Page and mail us your details. (Name & Subscribed Mail Id) with the Subject: Free License. There are also some Giveaways in Geekyard. Check frequently to get FREE softwares every month. Follow us on Facebook and Twitter to stay updated with future Giveaways. Great perform on my laptop…. How did i miss this? kis 2012 is best pc protection to any pc, nice giveaway.